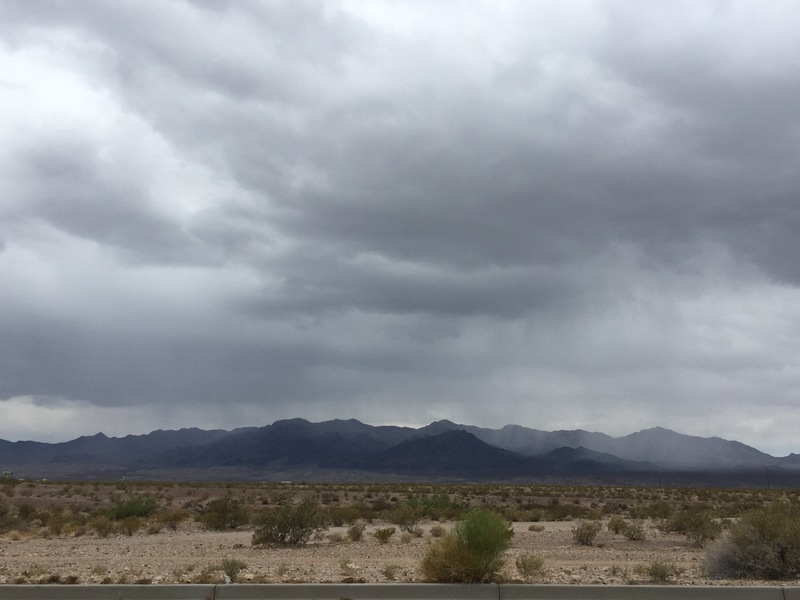 In Arizona, rain is good weather. This is a picture of a lesser nighthawk. They come into our area in the summer and you can see them flying around the lights on ball fields and parking lots hawking insects at night. They are strong flyers and a lot of fun to watch, but one of their most interesting traits is their vocalization. They make noises like sound affects in a Sci-Fi movies. There have been a few nights when the noises coming from the surrounding desert made me want to scan the skies for a flying saucer. I can picture a group of city dwellers camping in the desert. After nightfall, those sounds begin rising up around them, causing their imaginations to rise up within them. Given the creepiness of the calls and the furtiveness of the human imagination, one could predict a UFO sighting before the night is over. 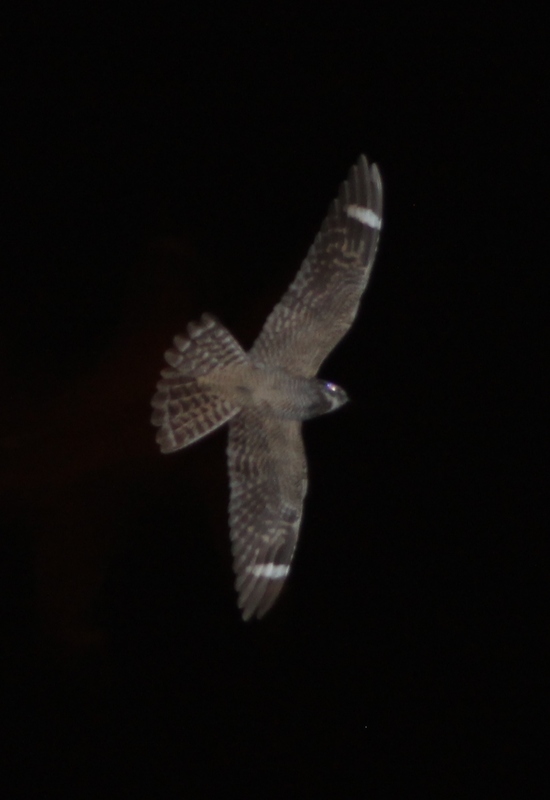 Only it’s not a UFO, it’s just a nighthawk dashing in and out of the corners of their vision as it grabs insects attracted by the people, the sweet smell of s’mores, and the light of the campfire. This alien assumption, which is so easily made about the lesser nighthawk, is also rather easily made about believers. We might not want to admit it, but at times we say things that sound completely alien to people who are unfamiliar with our language. Any or all of these terms might mean a great deal to us, but it is only going to help the unbeliever when we slow down enough to tell them what we mean by each phrase. Paul says a great deal about the importance of saying things in a way that can be understood in 1 Corinthians 14. Verse 9 summarizes the responsibility of the speaker in any communication to speak with clarity. I have run out of bird pictures so today I am showing you a picture of a javalina. 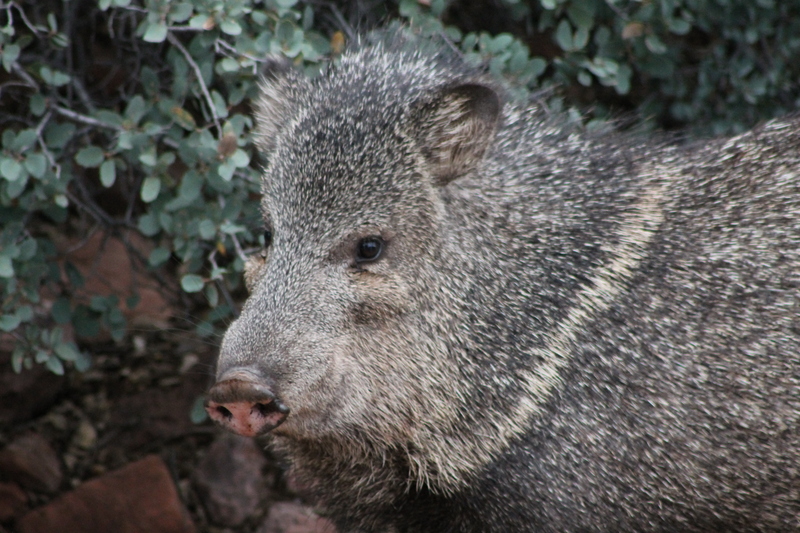 The more proper name for this critter is collared peccary. They look and sound like pigs, but scientists assure us they are not pigs. This particular one is a mom, and it made an appearance with several little ones, while I was on a mission trip recently. The closer look, and the lack of new birds to show you, caused me to do some research on this little pig. Uh Peccary. Just like pigs, they have a disk of cartilage forming that distinctive nose. That nose is a deceptively powerful organ and it is how they identify the world around them. You and I probably rely on our eyes the most, but a javalina will rely on its nose. The sense of smell is so specific that they identify each separate individual in their herd or family by smell, even from some distance away. As a person who often has strong allergies, and therefore often has almost no sense of smell, I cannot imagine what it would be like to stick my nose in the breeze and say, “Cousin Stinky is on his way over.” I admit I can identify a large number of people by the way they sound. I can recognize a number of people by the way they move, even when they are too far away to truly see. I can even tell by the way a hand lands on my back that it is my wife. But I cannot identify any of you by smell. Probably because of my nose blindness, to borrow a phrase from a commercial, I am surprised by 2 Corinthians 2:14-17, where the Bible teaches the importance of smelling good. Well, maybe not good, exactly. Maybe smelling Christ-like. 14But thanks be to God, who always puts us on display in Christ and through us spreads the aroma of the knowledge of Him in every place. 15For to God we are the fragrance of Christ among those who are being saved and among those who are perishing. 16To some we are an aroma of death leading to death, but to others, an aroma of life leading to life. And who is competent for this? 17For we are not like the many who market God’s message for profit. On the contrary, we speak with sincerity in Christ, as from God and before God. Let me try to help you to understand what it is asking for. We believers are to glorify God. We can do so because God will work in us to bring out a basic Christ-likeness. Here that likeness is described through the sense of smell instead of sight, but it is still being like Jesus that is being described. God sees this Christ-likeness, when we are obedient, sacrificial and choose to serve Him. Here described as the ‘fragrance of Christ.’ For other believers it is when we model the Savior that we attract them to salvation. We edify them in Godly living, and model Biblical living. In other words our lives demonstrate the life found in Christ. However the picture for the ones who will reject Christ is totally different. These are confronted with the sacrifice of Christ, His death on the cross. They become aware that Christianity is a death. To serve Christ they must die to self, to serve God they must kill their own ideas and lofty principles. For some this sacrifice, this death too self, is too much to ask, and to them we become an aroma of death. Don’t be discouraged, nor surprised by this; simply accept it as a part of God working through you. Today I found out that my brother’s family has an owl living around their house. This is the sort of news that gets a birder’s attention. I saw a picture posted online. It was obviously a small owl, but the picture did not provide for accurate scale. It had bright yellow eyes and small ear tufts. They live slightly northwest of Phoenix, Arizona. Given only this amount of information can the bird be positively identified? There are eight large owls, and eleven small owls. This was obviously one of the small ones. Of the small owls there are four which have ear tufts. Of the small owls with ear tufts there are two that would regularly occur in that range. Of the small owls, with ear tufts, in that range, only the western screech-owl has the yellow eyes. So it seems likely the bird is a western screech-owl—likely but not absolutely certain. The detail that is most likely to confuse the results is range. It is common for birds to be seen outside of their normal range. Birders frequently remind each other that the birds don’t read the field guides or honor their defined ranges. As it happens there is another owl, the whiskered screech-owl, that looks extremely similar to the western screech-owl. The whiskered is usually further south, but it is entirely possible for a bird to have wandered outside of the normal range. Christians could benefit from a discussion of range as well. One of the identifying marks of a believer is their moral stand. This pattern of living means there are certain places a believer is unlikely to go. Many years ago I was in a church that had a church covenant pasted in the front of their hymnals. It said, among other things, that the members of the church would not consume alcohol, and would not go into businesses that offer alcohol. I liked it. But I didn’t find it easy to follow back then. Furthermore in today’s world it would be impractical to follow such a guideline. Very few restaurants do not serve alcohol. Of course it would be possible to simply stop eating out at the places that do. However, every grocery store sells alcohol and therefore it would be impossible to buy food to prepare at home. So a strict adherence to the guideline would mean eating out at every meal, and predominantly from fast food places. This point serves to illustrate how hard it is to stay within your range. But I also know that many, if not most, Christians today do not agree with the guideline and therefore will not attempt to follow it. While we could have a lengthy discussion of whether it is right or wrong, what is and is not lawful or allowable for believers, that is not my point at the moment. What I want you to see for now is a simpler point. Christians are less identifiable in today’s world because they have taken away one of the field marks. Many people bemoan the loss of witness in today’s world, but they don’t seem to make the connection to our behavior. In years gone by believers were better at being different than the world around them, and this inherently attracted people who wanted to improve their life. Today Christians seem more interested in standing up for their rights than growing the kingdom, and the resulting patterns of behavior are not as attractive to the lost as past patterns were. In the Western United States we have outbreaks of different types of tree killing insects. Two notable ones have been bark beetles and needle miners. 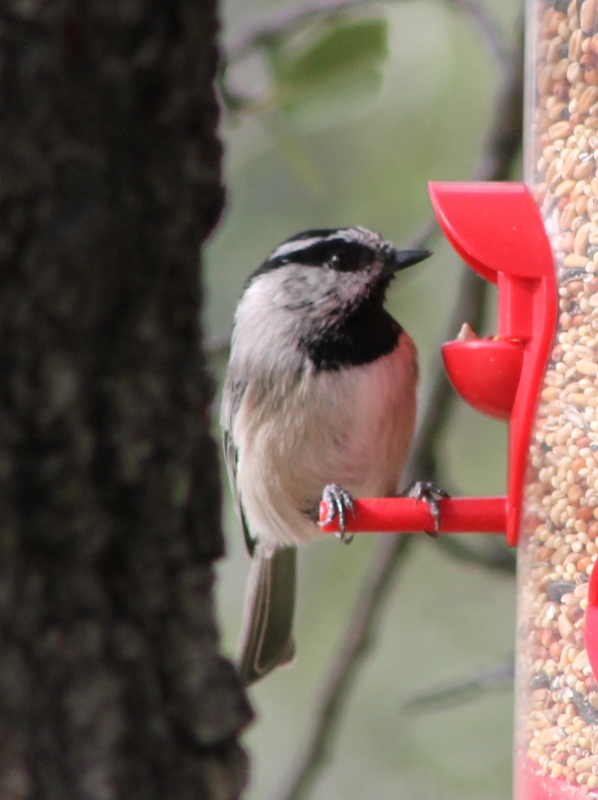 Mountain chickadees do their part to suppress these tree destroying insects. During an outbreak of needle miners in Arizona, a single mountain chickadee was found to have 275 of the tiny caterpillars in his stomach. Birds of many types are known to follow the populations of their prey. It might be owls going after rodents, Roadrunners after reptiles, or chickadees after insects but outbreaks of food sources are often followed closely by waves of birds ready to stabilize the overpopulation of their prey. Birds are able to respond in this way for a few reasons. Perhaps the greatest reason is their flight. They are highly mobile and this allows them to travel to a new food source readily. In addition to this they tend to be highly social. Even though we don’t always understand how birds communicate with each other, it is likely many species will not just pursue food for themselves but also draw other birds to the food source. Another reason birds make such a difference in controlling pest populations is they are energetic. It takes a steady supply of calories to keep these little dynamos moving. Christians should admire the positive traits of these avian defenders, and possibly imitate them in a few ways. The presence of Christians in a society, community, or neighborhood should always be a positive stabilizing affect. Our presence should help mitigate the presence of destructive behaviors, or sins. But beyond knowing what influence we want to have on society we should have some specific plans about how to get there. First we should be able to recognize what is good and bad within our world. Not by the opinions of media and culture around us, but by the more accurate eternal truth of Scripture. Having a clear view of right and wrong is central to Christians having the leavening effect on culture Christ expects us to have. about wrong requires us to be articulate. One of the reasons we have failed in some areas of the culture wars is not because we took the wrong position, but because we have failed to communicate the truth clearly. Finally we should maintain high levels of energy in promoting Biblical ideals and moral standards. It’s not acceptable to throw up our hands and surrender to the cultural immorality around us. Instead we must continue to fight the good fight. 2 Thessalonians 3:13 (HCSB) “Brothers, do not grow weary in doing good.” This verse is so simple in content, but so important in Christian living. One of the great challenges for our country is what to do about immigration. From my perspective the entire debate is missing the mark. There is immigration law defining who can come into our country, who is allowed to work, and who is allowed to seek citizenship. We spent remarkably little energy discussing these laws, and we are gutting our ability to enforce these laws, even though they are at the heart of the issue. Instead we spend a lot of time discussing peripheral issues. For example, here in Arizona there has been a major discussion about who is allowed to enforce the law. Many would like to convince us that immigration law can only be enforced by immigration officers. I wonder what it would be like if we used this kind of rule for other categories of crime. Only the DEA could enforce drug laws. Only the ATF could enforce gun laws. Only the Commerce Department is allowed to ‘notice’ if a person is smuggling. That idea is ludicrous. If a local law enforcement officer finds a meth house, a grenade launcher, or a secret pocket full of diamonds we would all expect them to respond, make arrests, report and pass the criminals on to the correct department. So why do we claim immigration laws have to be handled differently? Another example is we spend a lot of time discussing the plight of long term illegal families. Returning family members to country of origination splits up families, ruins careers, and derails education. But again, what would it look like if we used similar logic on other forms of law breaking. The meth house would argue it cannot be shut down because there are too many dealers on the street who would be put out of work. The illegal arms dealer would point to his children who would be harmed if he went to jail. The diamond smuggler would claim law enforcement was racially profiling him. We would be better off if our primary focus was on the immigration laws. Making excuses for those who break the laws is counterproductive, and harassing those who enforce the laws is silly. As a Christian I would like to see more people able to come to America and make a new life for themselves. But also as a Christian, I would like to see them do it the right and legal way.